Estimating time is one of the most difficult and most unsure activities during the planning phase of the project management process. We had a discussion recently with some colleagues of mine about the extra time that sometimes the developers or the project managers add to their estimates, called padding. There are two extremes about this approach. On the one side is the management’s urge to shorten the project’s duration leading to unrealistically short schedules. Sometimes the developers (usually younger and inexperienced ones) get infected by the flowing optimism and make unrealistic estimates, which you know are impossible to meet. Then, when you make the final schedule you add some percentage of time (usually between 10% and 20%) to make sure that even after the management shortens your schedule you will still have the necessary time to complete the project on time. On the other side there is a different story. Your team members are experienced enough, “old dogs” who know that whatever estimate they give, the management will cut it. Then they add this padding by themselves and their estimates become unrealistically longer. This way they want to make sure for themselves that after you or the upper management shortens the schedule, they will be able to fulfill their tasks within it. 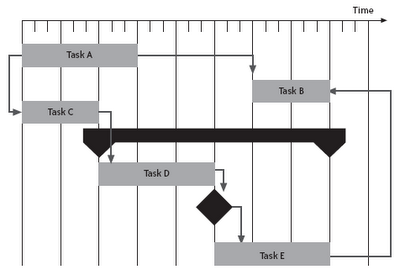 Do you know how your team members make their time estimates? Can you judge if their estimates are accurate? Do you know whether they estimate the tasks duration too optimistically or they put reserve time (padding)? Do you make any corrections to their estimates? Do you add your padding knowing that the management will shorten the schedule and will put you in a “Mission: Impossible” project or you shorten it by yourself knowing that your developers already had added extra time in it? Do you communicate your opinion within your organization honestly (your team members to you and you to your upper management) or you try to outwit each other? I am waiting for your comments impatiently. I work with my team members from a long time ago. They communicate their esimates honesty with me. However I add paddings in total estimate because my upper management shorten it ever. I do know how my team makes their estimates. you can learn that about people you work with. In most cases I can judge if the estimates are accurate. I teach my team to use their own buffers, so hopefully most of them do their part of padding. By the way: they usually need the buffer. I adjust estimates I get. Sometimes developers don’t know everything about the project environment. Sometimes because I believe estimates are (still) too optimistic. Sometimes it comes from putting together all the project parts (not only development). I don’t make special padding for management to cut. Two reasons for that, one worth longer writing. Another is I am the management. I don’t cut developers’ estimates. It doesn’t work. When we’re forced to deliver faster than we planned we change the way we work, not the way we schedule. But that’s a longer story. I communicate my opinion about scheduling and schedules honestly among the team. When we add buffer everyone knows it. On the other hand when there’s no place to slip everyone knows it too and no one expects some hidden padding added by PM. It works well that way, but that’s only the part of a bigger picture. I also use to add a little padding because of the unexpected risks that may occur. I believe that honesty is the best policy in all aspects of management and teamwork and it is also a key part in time estimating.